While many car accidents are simple fender-benders resulting in minimal damage, automobile accidents remain one of the most common causes of serious injury and death in New York. 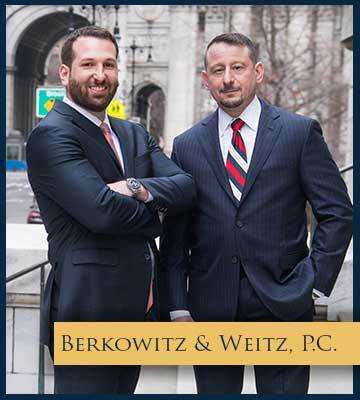 As a result, automobile, truck, motorcycle, and pedestrian knockdown accident lawsuits are among the most frequent type of civil suits filed by BERKOWITZ & WEITZ, P.C., and an area in which we have over two decades of experience. There are a wide variety of factors for which the driver of a motor vehicle may be found to have been negligent in their operation of that automobile, included but not limited to, driving while intoxicated, speeding and other traffic violations, failure to yield to other drivers and pedestrians, failures to obey traffic signals and sign, texting while driving, driving while distracted, as well as the mechanical failure of any of the various components of the motor vehicle itself, such as the braking system. Whether you were the driver of an automobile, truck, motorcycle, or you were simply crossing the street, if you are the victim of an accident due to the negligent operation of an automobile, we can help. Do I Have a viable AUTOMOBILE, TRUCK or MOTORCYCLE ACCIDENTS Case? Any potential personal injury case requires a detailed understanding of the facts, the processes, and the law. If an accident has impacted your life, you will want to consult with an experienced attorney to see if you should pursue a lawsuit. Please call us for a free consultation and we will be happy to discuss any potential case with you. WE ARE HERE TO LISTEN. LET OUR ATTORNEYS WORK WITH YOU TO START THE PROCESS.